Have YOU registered your Brittany’s Microchip? NOTICE: All adopters need to register their Brittany’s Microchip immediately upon adoption. The website for 24PetWatch is on the adoption application. Since August of 2013, all BRIT Brittanys are wearing a BRIT tag with an ID # and Pattie’s phone number. This system has helped us reunite many lost Brittanys with their families. 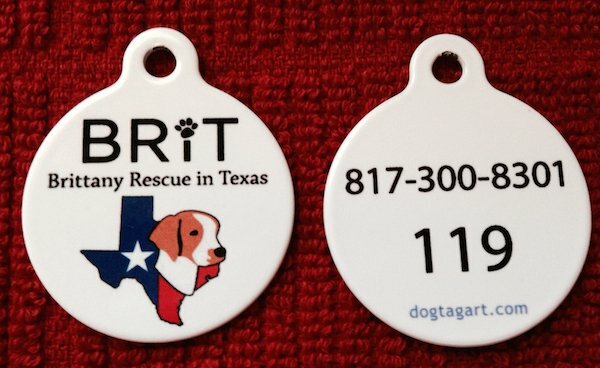 If you have adopted from BRIT, your Brittany has been microchipped. (This information is on your adoption agreement.) Most have 24PetWatch microchips, but some come to us already “chipped.” The other microchip companies include AVID and HomeAgain. Microchips and tags are essential for lost pets trying to find their way home. 1) Call the number on the MICROCHIP tag. 2) Give them your information. The chip is only as big as a grain of rice. It’s usually implanted in the scruff of your dog’s neck between the shoulder blades and doesn’t cause any pain for your pet. It’s so much safer than other forms of identification. If your Brittany gets lost, he might lose his collar and tags; if your dog is stolen, the thief might remove his collar and tags. With a microchip, you can help people who find your Brittany find you and if someone else says it’s their dog, you can prove the Brittany is yours. The microchip won’t track your dog though. Your dog has to be taken somewhere to be scanned. Veterinarians and shelters scan the dog for a microchip, then provide the code and phone number to the microchip company. The microchip company verifies that the microchip is up to date and who it is registered to. If you have not registered your microchip (and it’s a 24 PetWatch chip), they call BRIT and let us know this dog has been found but their chip has not been registered. We immediately research our records and contact you (the owner). If the Brittany was already chipped before we got them, BRIT is not in their database to call with a found dog. In this case we would not be able to find the owner. A microchip consists of a tiny computer chip housed in a type of glass made to be compatible with living tissue. The microchip is implanted under the skin with a needle and special syringe. The process is similar to getting a shot. Little to no pain is experienced – most dogs do not seem to even feel it being implanted. Once in place, the microchip can be detected immediately with a handheld device that uses radio waves to read the chip. This device scans the microchip, and then displays a unique alphanumeric code. Once the microchip is placed, the dog must be registered with the microchip company, usually for a one-time fee. Then, the dog can be traced back to the owner if found. Some microchips have been known to migrate from the area between the shoulder blades, but the instructions for scanning emphasize the need to scan the dog’s entire body. If your dog’s microchip is properly registered the likelihood of them being returned to you quickly greatly increases!